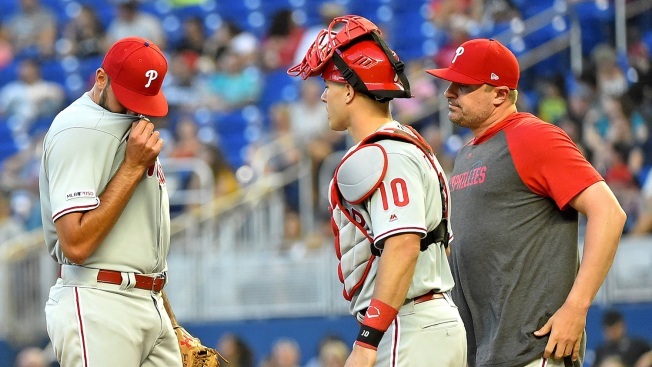 MIAMI - One night after pounding out 14 hits, the Phillies' offense sputtered early in a 10-3 loss to the Miami Marlins on Saturday night. The Phillies had just one hit through seven innings and six for the game. Five of those hits were doubles - two by Scott Kingery late in the game. Though off to an 8-5 start, the Phillies have lost three of their last four games and the offense has done little in two of them. The Phils were held to three hits, all singles, in Wednesday night's 15-1 loss to Washington. • The Marlins hit three home runs totaling 1,251 feet against Eflin in the third inning. Brian Anderson hit a first-pitch curveball, Neil Walker a 1-1 changeup and Austin Dean a first-pitch fastball. Dean's homer was a two-run shot and it gave the Marlins a 6-0 lead. He had five RBIs in the game.